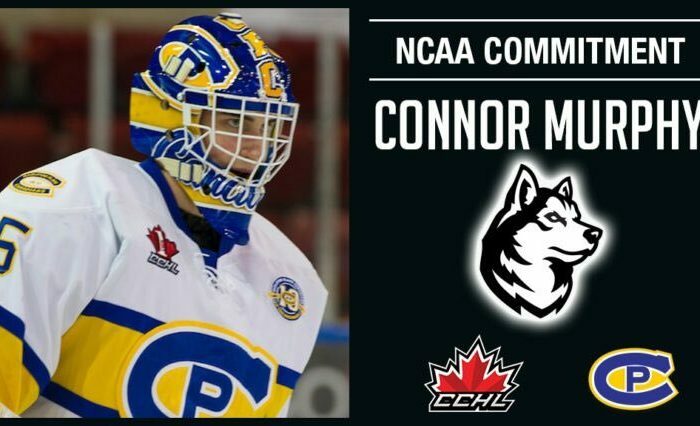 The day the Huskies – and their three Boston counterparts – have had circled on their calendars since February 14th of last season has finally arrived. The Huskies take the ice this afternoon at TD Garden for the first round of the Beanpot against the Boston College Eagles. 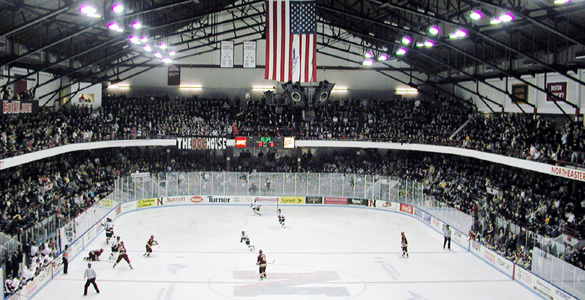 It’s a rematch of last year’s controversial consolation game, a rematch of the 2011, 2013, and 2014 championship games, and a battle between the top two teams in Hockey East to determine the winner of their season series. Sounds like a great choice for the early game to me! 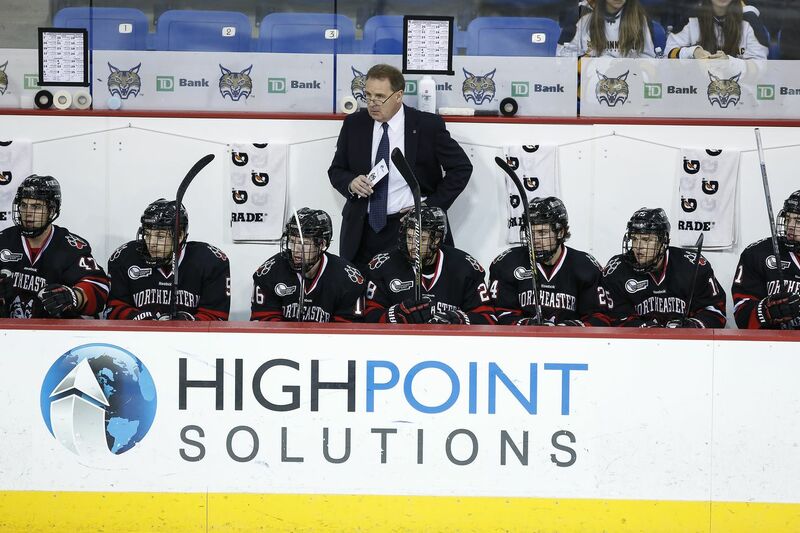 Stepping back for a moment, the Huskies faced UNH on Friday, a game in which Northeastern outshot the Wildcats by a 41-19 margin but couldn’t put the game away, drawing to a 1-1 finish at Matthews Arena. Max Gildon scored the UNH power play goal from the point while Nolan Stevens countered with a dangle through the offensive zone and the five-hole of Danny Tirone that checked in at #6 on the SportsCenter Top Ten. But the story wasn’t the pucks that went in but the pucks that didn’t. Tirone made 40 saves in a game that was either the epitome of luck or the coronation of the UNH netminder as the second coming of Domenik Hasek, as he flopped in every direction in the crease and refused to allow the puck to enter the net no matter how sure the chance looked. The Huskies went 0-5 on the power play, failing to score on 14 shots and culminating in a sequence in the final moments where two sure goals stayed out of the net only for the puck to find Adam Gaudette wide open at his spot at the bottom of the left circle. As the entire arena jumped up for the sure-thing game-winning shot, the Hobey Baker candidate and national leader in power play goals watched his stick snap in half and the blade fly into the air as the puck rolled harmlessly wide of the open goal. The tie gives NU just a single win in their last five games, with three dropped points to a Providence team that just failed to beat UVM on the weekend and three dropped points to subpar UMass and UNH teams. 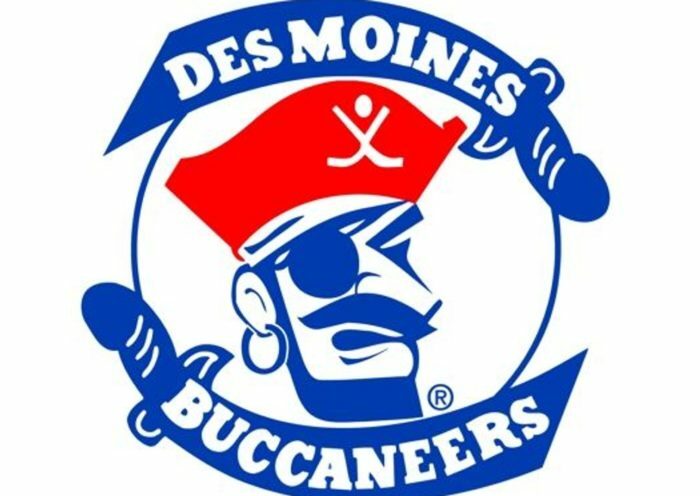 Head Coach Jim Madigan was clearly frustrated with his team after the game, alluding to the lack of production from the majority of the team outside of the top offensive line and defensive pairing (which is Davies and Cecere/Shea regardless of what the line chart may indicate) and calling out the rest of his players both in public and in private. Needless to say, not exactly the best way to lead-in to the Beanpot. Thing is though, and this may be a hot take even though it shouldn’t be, regardless of recent performance, the Huskies kind of have to be the favorite here. BC is above them in the Hockey East standings, sure, but that’s just about all they have going for them. They top the conference not because of dominance, but because of consistently refusing to be tripped up in conference games they’re favored in. BC is below .500, 4-5, in 9 games against NU, PC, BU, and Lowell. Until their loss to UConn on Friday Night, the Eagles were a perfect 13-0-0, undefeated and untied, against the teams at the bottom of Hockey East. Meanwhile they’re 0-5-3 in non-conference play, including games against underwhelming Quinnipiac, Wisconsin, Harvard, Northern Michigan, and Michigan Tech squads. What this leaves is an Eagles team with one calling card, a team that can be counted on to show up and pick up 2 conference points against bad Hockey East teams. It’s an admirable trait, sure, and one that I wish Northeastern shared this season. The last three weeks have shown that winning those games is harder than it looks. But that’s as far as BC goes, and the Huskies aren’t those teams and this isn’t a conference game. So really, all that needs to happen here is the Huskies have to win a non-conference game against a team with zero non-conference wins. They've won one. We've won one. The biggest one is tomorrow. The advanced metrics on the Eagles are fine, they have a Corsi somewhere between 53 and 54 depending on the situation and a PDO just north of 1, being boosted by Ryan Edquist’s numbers in the games he’s played in goal. Take him out of the equation use only the numbers for Woll and BC is suddenly sitting with a PDO closer to .994, predictable of a team with a goaltender having a down year and not much in the way of high-end scoring threats. The defense corps is where BC matches up with NU though, with Casey Fitzgerald still around and leading the charge over the likes of Husky-killer Michael Kim and Jesper Mattila. At forward, the top line of David Cotton, Julius Mattila, and Logan Hutsko is the one to look out for, featuring the team’s top two scorers and top three assist-leaders. The middle six are all players that don’t particularly scare you but also can score at a decent enough clip, not unlike NU’s middle six. On special teams the Eagles are painfully average, 36th in the country on the power play and 29th on the penalty kill. They’re 6-3 in one goal games and have been outscored on the season, while the Huskies maintain a +31 goal differential. All that is really just a long way of saying, nothing about BC’s season gives you reason to believe they’re the favorite in this game. They might have a bit of an advantage in depth, especially on the back end of the blue line, their top line doesn’t hold a candle to the 9-8-21 superline, Casey Fitzgerald is very good but he’s no Jeremy Davies, and Joe Woll, pedigree and all, is saving 20 points below Cayden Primeau this season. This isn’t to say that BC can’t win, Woll has an infinitely better chance of going off and dominating a game than, say, oh I don’t know, someone like Danny Tirone does. They could play along the boards and keep the Huskies pinned and away from the puck with their grinders. They could shut down the NU power play with their experienced defense, much like they did at Matthews in a win during the fall. But none of those things should be the expectation going in and if they happen, they should be seen as a disappointment by Husky fans. 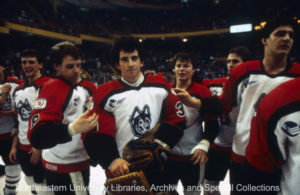 For the first time in recent memory, maybe the first time ever, certainly the first time since the 1980’s, Northeastern enters the Beanpot the highest ranked of the four teams in every conceivable measure, be it the Pairwise, RPI, KRACH, or either of the two polls. They’re 3-1 on the season against the Comm Ave schools. The team undoubtedly has flaws, but they also have the best line in college hockey and, for the first time in what feels like forever, goaltending. If ever there were a year for it to happen, this sure as hell seems like the one. 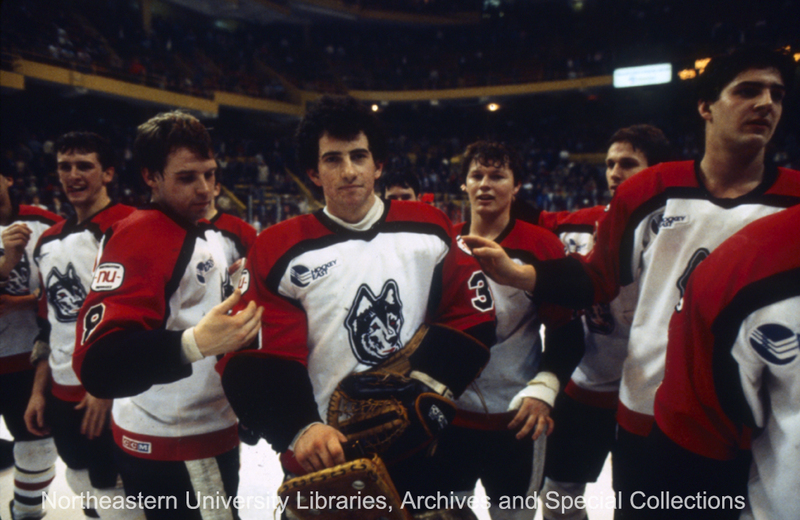 The Huskies are the Beanpot favorites. Oh, and by the way, if (emphasis on the IF) they get past BC, Harvard and BU both lose a top forward to the Olympics for the finals. Thanks for that one, USA Hockey. Editor’s Note: This is why he’s in last place.